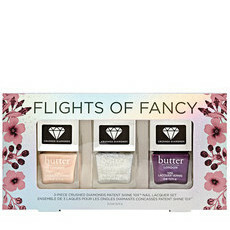 Butter LONDON Delightful Darlings is from the festive Holiglaze Collection by Butter LONDON, and is a fade-resistant, full-coverage 6 Piece Petite Patent Shine 10X™ Nail Lacquer Set presented in a lustrous, holographic gift box. 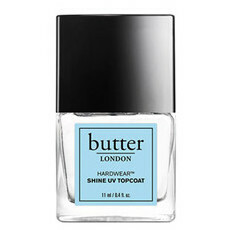 Made with Butter LONDON's Patent Shine 10X formula, which gives nails a gel-like cushion finish with high-gloss shine, these vibrant colours range from soft, pale pink to deep plum and rich, shimmering red, and are 8-Free to care for the health of your nails. They have a curved brush for easy application, and feature Shock Resistant Polymer Technology to keep them chip-free and flawless for up to 10 days. High quality polish disappointing that some of the others are almost identical. Would be nice to have more of a colour range considering there are so many.